This essay is composed by Reginald P. Brown IV, who is a dear friend and former colleague of mine. While this isn't an original work of mine, I often find that others articulate ideas better than I am able. This essay is a perfect case in point. The ideas and opinions expressed in this essay by Mr. Brown exactly reflect that of The Website High Atop the Thing and its webmaster. I’ve felt compelled to finally articulate what I think about the use of the “Rebel” flag as it’s flown in the south. More specifically, as it’s flown by the state of South Carolina. I am, after all, a voter here now. While it’s certainly the right of an individual citizen to fly the flag that represents rebellion against the United States of America, that isn’t necessarily true of a state that is part of our Federal system, and no longer in open rebellion against it. Still, there are reasoned (although I feel uninformed) arguments in the name of flying it at the Civil War memorial in Columbia. First up, it’s allegedly flown for historical purposes, but it’s the wrong flag for that. And I also want to address the idea that the Civil War was not fought over slavery, which it most certainly was. Of course, there is a big problem with this argument, namely, Major Watson and his South Carolinian brothers never fought under the flag flown at their memorial. Since we’re using history as our argument, how does it memorialize South Carolinians that gave their life when the flag flown is that of the the Army of Tennessee? What we know commonly as the Confederate flag today, was not the flag of the confederate States of America (first of their three flags:https://media.vocativ.com/photos/2015/06/Flag_of_the_Confederate_States_of_America_1861-1863.svg_.png), nor the flag flown by South Carolina in battle (https://upload.wikimedia.org/wikipedia/commons/thumb/a/a0/South_Carolina_Sovereignty-Secession_Flag.svg/330px-South_Carolina_Sovereignty-Secession_Flag.svg.png). The Battle Flag of the Army of Northern Virginia was similar to the flag in question, but it was square. If we want to use history as our argument, it needs to be on our side. The state started flying that flag (the wrong flag) in 1961, and it’s been flying for too long. Understanding that it was never the flag of South Carolina, nor the Confederate States of America, and that it has since been used as a symbol by white supremacy movements, perhaps we should bring it down. We aren’t taking anything back from the hateful organizations that use it as a symbol by flying it, so why fly it? And we aren’t even flying the right damn flag. I also want to talk about something that I’ve heard from a lot of young, relatively learned individuals: The Civil War was about state’s rights, not slavery. This is an oft asserted, oft taught “fact,” that flies in the face of source documents. What better place to go to find out why states were attempting to vacate the union, than the documents where they outlined their reasons in their own words? There is more, but that’s the second sentence, I don’t think you need more than that. Like Mississippi, that’s the second sentence. It goes on with such arguments as why they don’t like Lincoln: “The party of Lincoln, called the Republican party, under its present name and organization, is of recent origin. It is admitted to be an anti-slavery party…” Georgia had a lot to say, but nearly all of it was about slavery if you want to read the whole thing. Given that the war wasn’t about slavery, they sure talked about slaves a lot in their articles of secession. Of course half of the revisionist argument is correct, it was about states’ rights, it’s just that the right that the states in rebellion were worried about was the one to own slaves. And trades slaves. And not have pesky Yankees helping those slaves to escape. I am tired of “history” being used as an argument for the flag to be kept, because it’s a bastardized version of history. 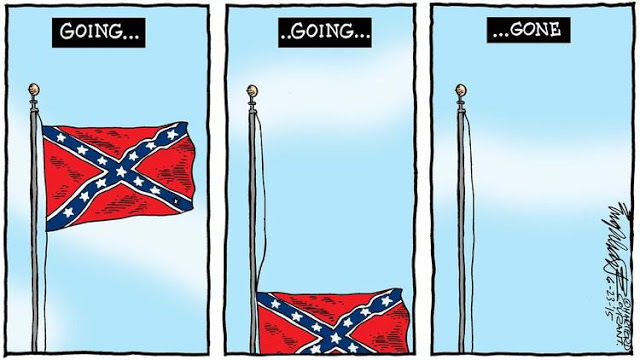 It’s time to tear down that damn flag.